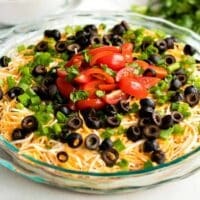 This seven layer dip, sometimes called seven layer taco dip, is one of the best Mexican style appetizers. I am a sucker for any kind of Mexican food. I’m also a sucker for appetizers (especially appetizers in the form of dip). A Mexican appetizer? Now, that’s something I can get down with. When entertaining guests, serve it alongside cream cheese dip, cold crab dip, or buffalo chicken dip. 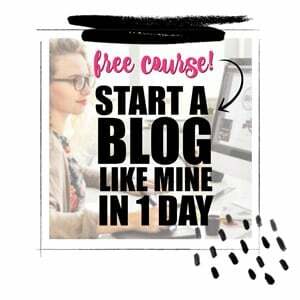 It’s truly one of my absolute favorites and making it really couldn’t be easier. All you need to do is gather the ingredients, chop up a couple of things, and put them all together. Easy as that. You can whip it together less than 20 minutes before heading to a party — or even a baby shower! Fair warning though, it’s addictive. One dip in, and you’ll be prying yourself away. It’s just too good. If you are a fan of guacamole or salsa (or both) then you are sure to love this. Both ingredients make an appearance in this dish. Serve it up with your favorite tortilla chips. I personally like to make a homemade guacamole to add into this recipe. Guacamole is actually quite simple to whip together. And the taste of homemade guac just enhances the dish. There’s nothing like fresh avocados! Yum! If you’re not up for the challenge or just want to keep this recipe as quick and easy as possible, no worries. We get it it! And luckily there are plenty of great options for pre-made guacamole at any grocery store! Any option will be just fine for the recipe. Another option is to check in with a few restaurants in your area that make and sell guacamole! Many Mexican restaurants make it fresh and you’re able to purchase it to take away. A chunkier salsa tends to work best in this dip. It layers better. The thinner, more liquid based salsa send to give the dip a runnier texture. This can cause the layers of the dip to start to separate a bit. If you’d prefer a smoother salsa, make sure you check out our recipe for restaurant style salsa. As I said above, this recipe could not be easier. The only major step in the instructions is to layer the ingredients. Simple, right? Start by spreading the refried beans on the bottom of your dish. I made mine in a deep dish pie plate but you can also make it in an 8×8 square dish or even in a bowl. Next, spread the sour cream on top of the refried beans. Then, spread the guacamole on top of the sour cream and then the salsa on top of the guacamole. Top the salsa layer with an even amount of your Mexican cheese blend. After, you can sprinkle the sliced green onions evenly over the cheese layer and then sprinkle the black olives on after that. You can also garnish with fresh tomato and fresh cilantro if you’d like. I love cilantro and I think the flavor is a really nice touch on this dish. It goes great alongside a bowl of beer cheese dip. 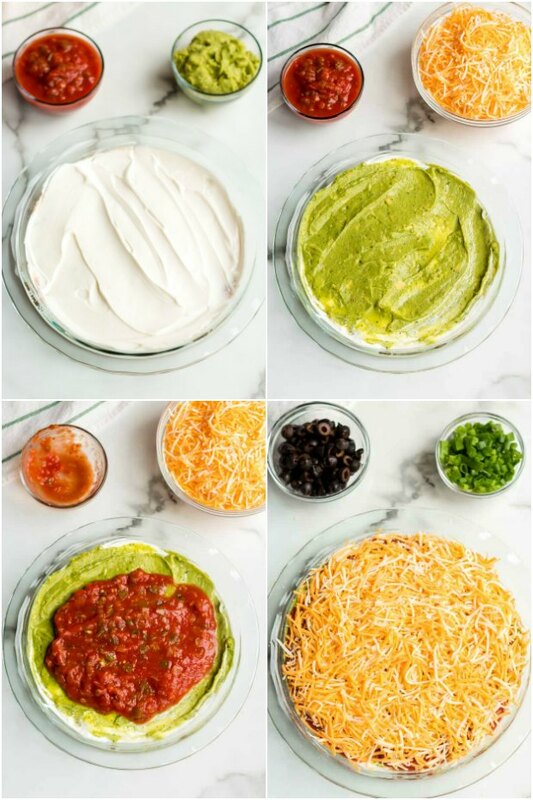 TIP: You can also serve this dip with some additional toppings for people to add on as they like. Jalapeños for the spice lovers, onions are a great option, as well as green olives, and extra fresh tomatoes and cilantro for those who like extra flavor. I personally always go for the scoops on this dish. Scoops tend to hold up really well to the weight of the dip. They also get the perfect ratio of all seven layers in every scoop. Otherwise, any tortilla chips will do. 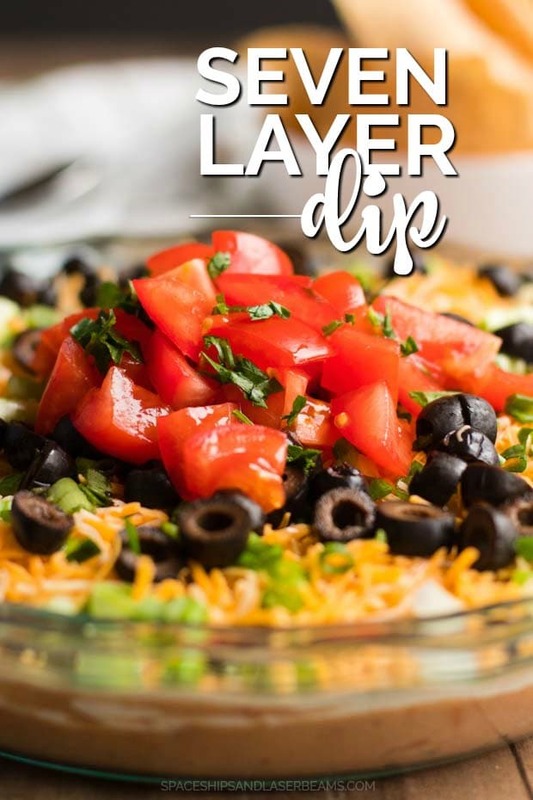 The corn tortilla chips are another great option because they also tend to be a bit stronger and hold up well against the seven layers of this dip. 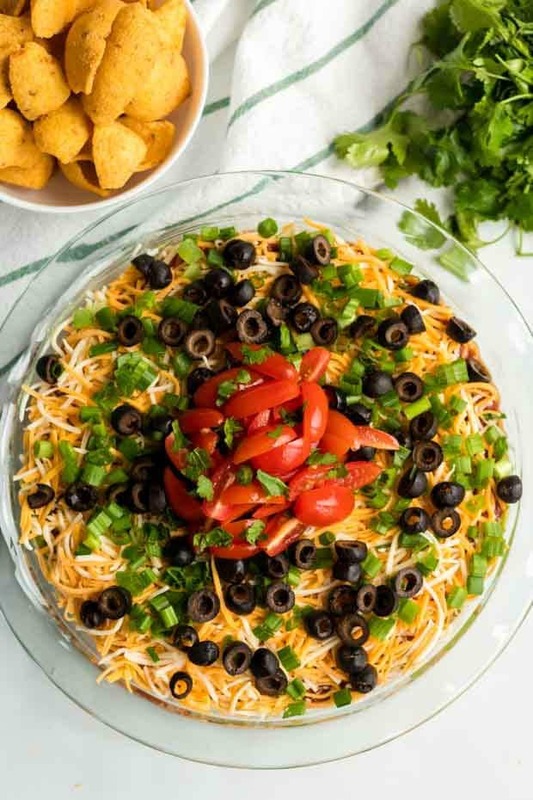 This seven layer dip, sometimes called seven layer taco dip, is the best Mexican style appetizer. Spread refried beans on the bottom of your dish. You can use a deep dish pie plate or large bowl or even an 8x8 square baking dish. Next, spread a layer of sour cream over the beans. Then, spread guacamole on top of the sour cream and then salsa on top of the guacamole. Top the salsa with a Mexican cheese blend. Finally, sprinkle green onions and black olives. You can also garnish with fresh tomatoes and fresh cilantro. Serve this dip nice and chilled with your choice of tortilla chips or scoops style corn chips. 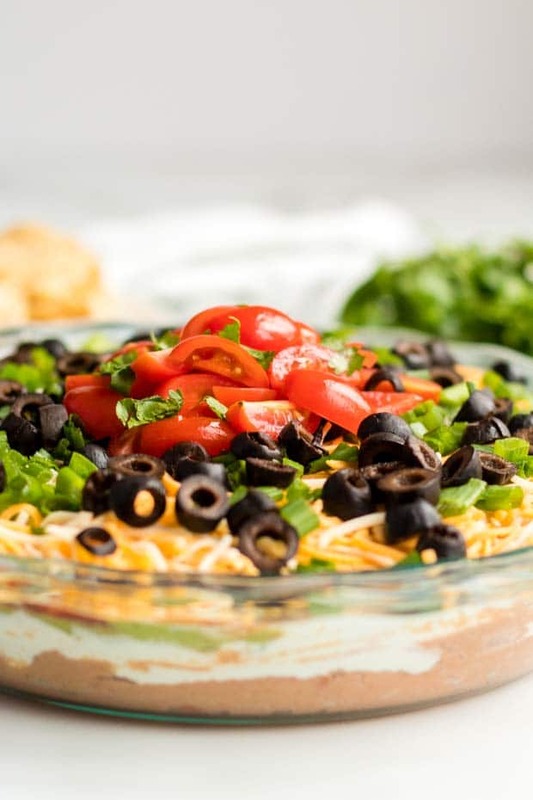 We love this easy dip recipe… so good! This is a great go-to dip for game days!! It’s always a hit.